The Abbey Church of Saint-Savin sur Gartempe is an 11th century Romanesque church noted for its well-preserved mural paintings. These painted biblical scenes date from the late 11th, early 12th centuries, and have given the church the nickname of "Romanesque Sistine Chapel". Below the church is the Crypt of the legendary martyr brothers St Savin and St Cyprian, also frescoed with the lives of these two saints. Saint-Savin sur Gartempe is a quaint French village with just over 900 inhabitants. It has a couple of hotels and restaurants, and as I was pressed into slow travel because of limited public transport options I found the place pleasant enough to stay overnight. I had a fine 4-course gourmand dinner at Le Patisson, the quality of which in such a small town provides at least one reason why so many NW Europeans choose to move to rural France. But of course at the end of the day I came just for its enlisted Abbey Church and its medieval murals. The next morning I started with a walk along the Gartempe river and across both bridges for some photos of the Abbey. Its size is remarkable for such a small town and it was fully included in the core zone by a minor boundary modification in 2015. Most of it though is from a much later date than the medieval murals that provide the site’s OUV. Entrance nowadays costs 8 EUR, which includes a good booklet with explanations (without it is 1 EUR less). There's a large souvenir shop, where they even sell lollipops displaying the logo of this WHS. After buying the ticket one is directed first to the main Abbey (which features an exhibition) and the gardens, but these are mildly interesting to say it nicely. To get to the murals, you have to take another entrance: the front door of the church. At the church I was the only visitor. Upon entering the candystick-coloured columns definitely stand out. I know I’ve seen similar ones before – probably at another WHS, but where? There are some paintings already in the porch of the huge gothic tower, where you enter. These include the Lady and the Dragon, with an especially fierce dragon. 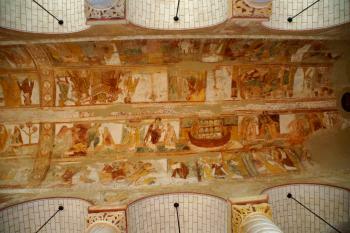 The uninterrupted strip of main murals is located in the nave, painted at a height of 17 meters in a semi-circle. The most famous painting is Noah's Ark, a crowded wooden boat with 2 copies of a few animals in front of the windows and several human passengers at the top deck. Most interesting I found the Tower of Babel - not really on scale, but you see people in elegant robes supplying stones to the builders at the top. And there’s also God introducing Eve to Adam, both looking like primitive cave people. Getting to Saint-Savin by public transport is not an easy task as the schedules are mostly geared to daily commuters. The slow bus 103 leaves Poitiers 5 times a (week)day for Chauvigny, a town 19km away from Saint-Savin. Twice daily this bus connects with a ‘bus on demand’ for the final km’s, a service that has to be booked a day beforehand by phone. Otherwise you have to hope someone else did that already and you can ride along (I was lucky on a Thursday evening). As a last resort there will be taxi’s. There also is a second bus company, TER, covering this stretch – only a couple of times a day as well but they take a faster route and do not have to be prebooked. This seems to be the best choice, but I only found out about them on my way back. Off the beaten track abbey church of Saint Savin sur Gartempe was on my wish list to visit for quite a long time since my first visit to Poitou region 11 years ago. When our family friend asked us to choose between La Rochelle or Saint Savin for next day trip, and my young nephew wanted to see aquarium desperately, so I had to go to La Rochelle instead as the idea to see abbey with fresco was sounded too boring for him. After that day, I had no opportunity to revisit Poitou. So when my friends and I planned to have vacation on Pyrenees by selves-drive, Saint Savin immediately came up as one of the must stops during this long journey. After great late lunch in Bordeaux, I drove as fast as I could to reach Saint Savin before 4 PM which is one hour before its closing time. At the end we arrived Saint Savin, a very pretty village, at 4.35 PM, since it was almost closing time, the abbey staff allowed us to see the famous church with no concern of ticket. When we entered the church, my friends and I were deeply impressed by its warm earth tone interior. 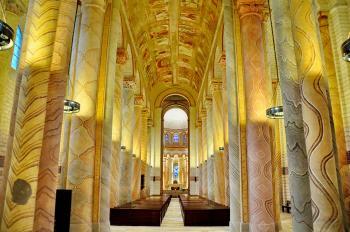 However instead of the famous fresco, the colorful columns along the nave and aisle first caught our attention. These columns are really pretty for its pastel colors and the way of its coloring to mimic the colorful marble almost liked sweet stick candies. To my surprised the chancel of the church are also really nice with very fine wall painting, fade but still visible. After appreciated with many parts of this beautiful church, my friend and I spent the last 10 minutes to admire the famous ceiling fresco. Thankfully that my friend decided to buy explanation pamphlet so we can understand the story of the fresco. The fresco indeed is really impressive and really one of the best Romanesque ceiling fresco I have seen, but to say that it is comparable to the Sistine Chapel in Vatican City is maybe over exaggerated. Even though it was a very short visit, I felt very happy that the abbey church is really impressive and made me felt relieved that the site I want to see for the past 11 years is actually really worthwhile to visit. To say that the site is off the beaten track is maybe not correct, even in the cold rainy day of March, when we approached the abbey almost its closing time, more than 30 tourists were still in the complex. Visiting Saint Savin reminded me the visit to UNESCO listed Bourges Cathedral, these two religious sites seem to be unknown but turn out to be one of the nicest religious buildings in France, and very fine World Heritage Sites. 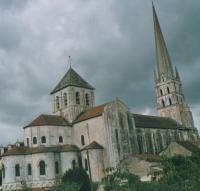 The Abbey of Saint-Savin is one of those sites that I have only visited because it is a WHS. Saint-Savin is off the beaten track and although our visit was in high season (end of August 2015), we had the abbey almost all to ourselves. The abbey and the church are nothing special, the view from the bridge over the Gartempe is quite nice, but the big (and only) attraction is the wall painting. Most of the murals are on the ceiling of the vaulted nave, four rows of paintings depict scenes from the Old Testament, from the books of Genesis and Exodus. I'm not well versed in the Bible, so I was happy that I had picked up a booklet with explanations at the ticket office. However, some of the scenes are easy to identify, e.g. Noah's Ark, the most striking (shown in Clyde's photo), or the Construction of the Tower of Babel. About ten years ago the nave was renovated and the murals were cleaned. I do not know how it looked like before, but obviously they have done a good job, the paintings are incredibly well preserved. "Known as the Romanesque Sistine Chapel" (cited from the sparse description on the WHS website) is clearly overdone, I would rather compare it to the Val du Bois WHS. Apart from the fact, that in Spain most of the originals have been transferred to museums. But style and quality of the murals are comparable. The drawback with paintings on the ceiling is that you permanently have to put your head back. And that they are at a certain height, in Saint-Savin the nave is 17 metres high. So it's a good idea to view them through a pair of binoculars or the telephoto lens of a camera. I took photos of almost all the paintings, and to be honest, I spotted many details only when I watched the photos on my computer. 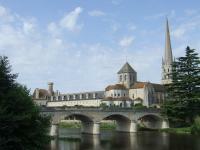 Saint-Savin is a half-day trip from the Loire (about 1.5 hours from Tours). We combined it with a visit of Bourges Cathedral and Saint-Hilaire-de-Poitiers in Poitiers (part of French Santiago de Compostela WHS), which means that we spent most of the day in the car. But I ticked off two new WHS, so no question that it was a worthwhile daytrip. I visited this WHS in July 2014. It was one of my stopover points during my road trip to Portugal. It's quite out of the way and perhaps that is why not many have visited it. Nonetheless, it's worthwhile visiting and there are interesting places to visit nearby such as the Medieval town of Chauvigny and the Church of Notre-Dame la Grande in Poitiers (with a night light show in the summer months). Saint Savin sur Gartempe is a small quaint town with a huge abbey church. The best viewpoint can be enjoyed from the Medieval bridge on the opposite bank of the Gartempe river. The abbey and church proper can be visited for 6 euros and every 30 minutes or so there is a free guided visit in English. Part of the abbey has been converted into a visitor centre with several interactive information boards and videos. The church murals were definitely the highlight of my trip comparing them to the Sistine Chapel perhaps is a bit too much. I think that comparing them to the murals of Reichenau would be more appropriate. 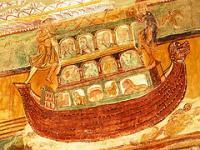 My favourite mural was the scene depicting Noah's ark (picture). On the whole it was a pleasant stopover to yet another splendid WH abbey. Located in a small town in the Poitou region, the magnificent abbey of St-Savin is nicknamed the "Romanesque Sistine Chapel" for its murals showing biblical scenes dating from the 11th and 12th centuries. They are almost perfectly preserved and well worth a closer look, even though you have to crane your neck, since most of them are on the abbey's ceiling. There is also a quite interesting exhibit on the history and preservation of the murals on the upper floor (in French only, of course), as well as a small garden. The best views of this quite large building can be enjoyed from the opposite bank of the Gartempe River. St-Savin can be reached by bus from Poitiers (about a 50-minute ride), but this has to be planned carefully, since there are only a handful of buses every day (no more than 4). Still, a very worthwhile excursion. 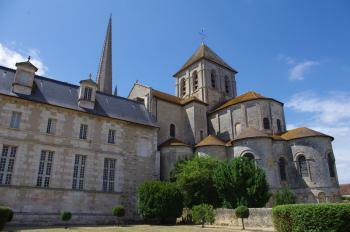 The Abbey Church of Saint-Savin sur Gartempe is well conserved edifice located on the Gartempe River in the Poitou area. This building is remarkable and famous for its collection of well conserved Romanesque mural paintings. These paintings represent several episodes of the Holy Bible and were used to teach religion to people that generally were not able to read. Build during the 12th century, the abbey in a real splendor as well as a beautiful example of religious artwork. Travelled by bus from Poitiers bus station to St Savin sur Gartempe, arriving by the bridge over the river. The abbey and the church with its tall spire dominate the village. The restoration work now having been completed the interior is magnificent again. The frescoes on the walls, columns and ceilings in the nave look bright and fresh, while those in the chancel are original and worn-looking. The ceiling frescoes, scenes from the Old Testament are especially interesting. In our trip to France we have visited the church in Saint-Savin-sur-Gartempe, that was part of an abbey, a Romanesque masterpiece with simply lines and only a tower as façade; it has also a nice apse with radiating chapels, an ambulatory and a square porch. Inside there is a nave with nine bays, barrel vaults, rounded arches and a double row of columns with capitals sculpted with animals and plants; the lower lateral naves have groin vaults. The church is from the 11th century but there are some older parts: the base of the porch, the transepts with wings, the absidioles, the square tower and the crypts. The church is famous because of his frescos, representing on the vault of the porch and on the tympanum of the doorway the Apocalypse, on the barrel vaulting of the main nave 28 biblical scenes, on the upper tribune of the porch the Passion of Christ and scenes of martyrs, in the choir and on the piers of the transept many saints and on the walls of the crypts the story of St. Savin and St. Cyprian. I was a little bit disappointed by the church because I imagined it more impressive but I liked very much its frescos. It's worth to be visited if you are in Poitou and justifies the inscription because of its frescos, the nicest Romanesque paintings in France. Highly impressive. It looks like a church from outside. But once you get in, it is a stunning and overwhelming experience. It really is the Romanesque equivalent of 'the' Sistine Chapel in Rome. 4.0: Walter Craig Harder MaxHeAnou Antonio J. 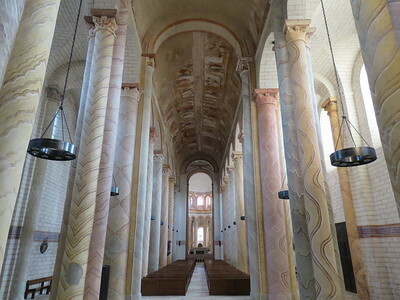 From "Church of Saint-Savin sur Gartempe" to "Abbey Church of Saint-Savin sur Gartempe"
Named after a local Christian saint: Saint Savin was a hermit and "one of the first Christians to have evangelized the Lavedan valley"
Dubbed as another WHS: Dubbed the "Romanesque Sistine Chapel"
89 Community Members have visited.